Zombies! Leg it! 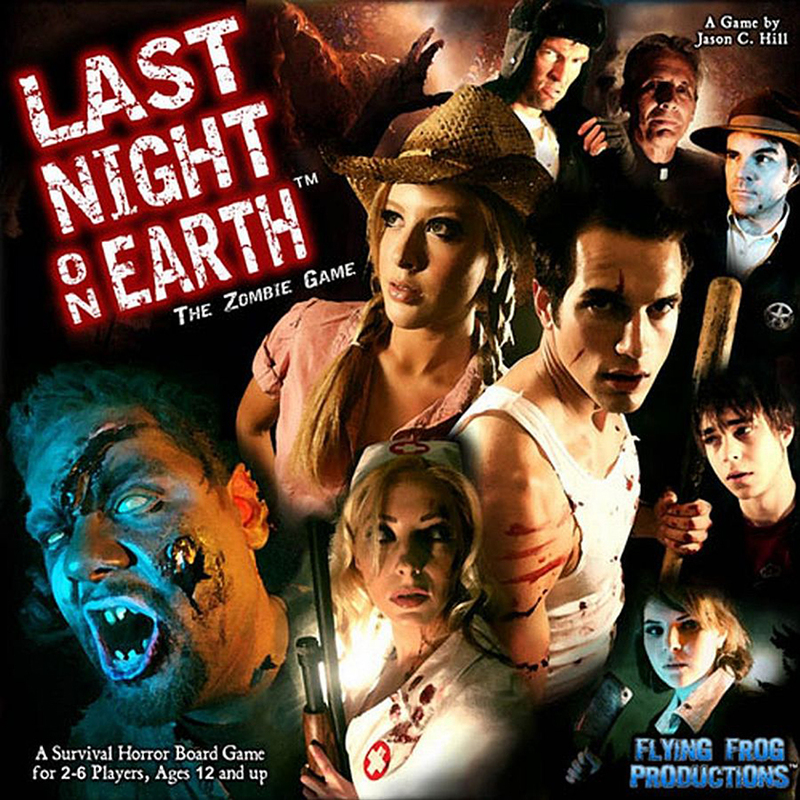 Last Night on Earth – Review. I haven’t bought a boardgame in a while, so the other week I had a chat with our FLGS and walked away with this: Forty bob of zombie fun. That’s pretty damn reasonably priced for boardgames these days, so I gathered some willing victims and we set about fighting the undead hordes. I was impressed on opening the box. Flying Frog have put a lot of thought and effort into this game, but they also aren’t scrimping on the physicals. Regular (hero and zombie) cards are thick and laminated, plastic pieces are nicely modeled and moulded, the board is wonderfully detailed, and the Scenario and Character cards are hefty pieces of dense card which won’t bend easily. Plus this game comes with its own soundtrack CD. Yes, while running around desperately trying to survive the zombie apocalypse, you can listen to some very good, atmospheric music which neither intrudes on nor makes the game any more serious than it intends to be. Everything in this box contributes in some positive way to the game overall. All art is shot using models who’ve gotten brilliantly in-character for each piece, and overworked in a painterly style. Even the art for various card abilities features the characters who are in the game itself. It was easy to set up, easy to learn, and easy to play. We ran through the basic starter scenario, “Die, Zombies, Die!” which is weighted in the townsfolk’s favour, with two players handling two Heroes apiece and two handling Zombies. The heroes we randomly pulled out – Nurse Betty, Father Joseph, Billy, and Sheriff Anderson – complemented each other very well, and we clumped together in a small building so that we could be exchanging items and healing each other without too much effort. Betty got herself a shotgun and turned into some kind of ninja, Sheriff Anderson kept throwing away empty pistols then picking them up again the next turn (he really did have the shittiest rolls I’ve ever seen), and Father Joseph was being quiet and mild-mannered until he picked up a baseball bat, at which point he flipped out and started playing whack-a-mole with Zombie heads. All in all our first game lasted around three hours with four players, and was awesome good fun. It’s really well thought-out, doesn’t take itself too seriously, and players aren’t left sitting in the lurch while others take their turns because cards in your hand might be usable in all kinds of situations. The other hero player saved Betty’s arse with a First Aid kit during my turn, and the Zombies were frequently enhancing each others’ zombies with their own cards. You get several scenarios in the box, as well as advanced cards for both Heroes and Zombies, giving this game some serious replayability. Flying Frog then also have additional downloadable scenarios on their website, totally free. You can go buy expansions, but I’m thinking the core box plus the website freebies are enough to keep this game going for several plays before even needing one.